Three lovely hardy Gardenias with contrasting flower forms, perfect for borders or patio pots. Delightful, snow white, waxy flowers appear in summer with that sweet Gardenia scent, even outdoors! Bushy, small leaved, evergreen foliage, great in small pots, in full sun. Winter hardy down to minus 10 degrees! Supplied as a pack of 3 plants in 9cm pots, 2 years old, approx. 15-20cm tall - one each of Kleims Hardy, Crown Jewels and Pinwheel. 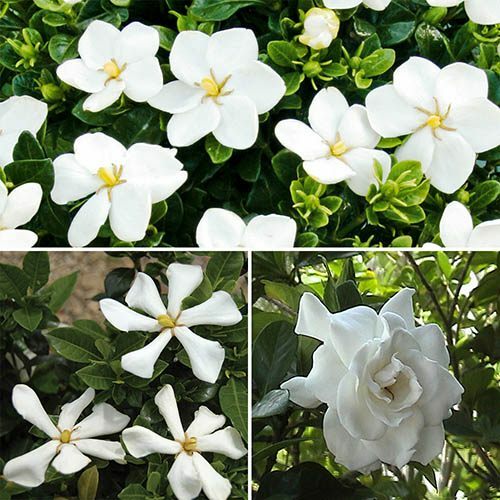 Truly hardy Gardenias with the most exquisite snow-white flowers on a backdrop of glossy green foliage – the perfect pair of shrubs to add elegance to your garden. A compact shrub ideal for gaps in borders or containers on the patio, this collection includes varieties that produce that hypnotising sweet fragrance that is widely used in perfumes. Plant around entertaining areas in the garden or along pathways and near entrances where you can fully enjoy that much sought-after scent. The classic single, star-shaped flowers of the ‘Kleim’s Hardy create a simple, understated elegance, whilst the showier double, rose-like blooms of the ‘Crown Jewels’ can be cut and used in stunning vase displays. New variety ‘Pinwheel’ that we have added to this collection has slender petals that will bloom heavily from late spring, through summer and even into the autumn. Flowering all summer-long, smothering the rich green waxy foliage, these beautiful flowering shrubs will provide you with months of flowers and fragrance, but they’ll also keep their evergreen leaves for interest all year round. Easy to grow and maintain, simply pant in a pot or straight into the border, preferably using ericaceous compost, and it will happily grow and flourish outdoors all year round. Supplied as a collection of plants in 9cm pots ready for planting out or repotting. One each of the following varieties; Pinwheel, Kleim’s Hardy and Crown Jewels.